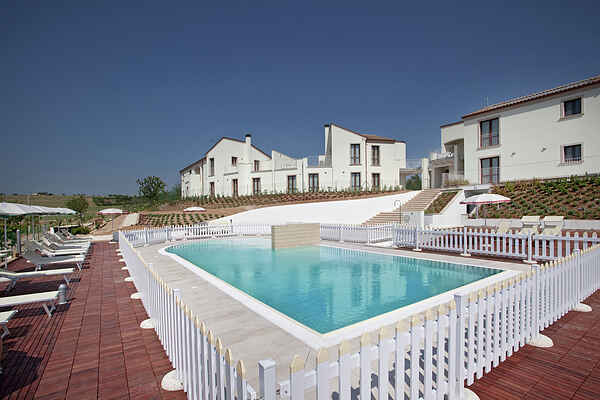 This wonderful, modern holiday home is located in the grounds of a former 'borgo'. During the conversion into a holiday park, the environment was given due consideration through the use of solar panels. The ground has various communal facilities. There is a fruit orchard with a footpath running through it, which is brilliantly illuminated in the evening. There is also a gymnastics track, a barefoot path, a labyrinth, a playground and a wonderful swimming pool. The holiday home (on the ground or first floor) is situated in Contea dei Cilliegi, located on a hill at the westernmost point of Le Marche. The location provides a wonderful and varied view. On the one side you look out over the sea and beach and on the other, over a 180,000 hectare nature park against a mountainous backdrop. The wonderful beach at Pedaso is only 1,500 metres from the house. Its wide sandy beaches, fun eateries and the lively fishing port make it a real winner. The barefoot path is 50 meters long and consists of 8 different materials including cherry stones, pebbles, bamboo, bark and cold water. Walking on this path gives more energy and a sense of wellbeing. In the maze you can walk around and you unwind, perfect for concentration problems.